Got a hankering to set the night ablaze with music, art, fire and dance, but have neither the time nor disposable income to make it out to Nevada's Black Rock Desert for Burning Man 2016? Looking for a warm-up event to prepare for next month's annual Rainbow Gathering, which this year descends on Vermont's Green Mountain National Forest? Then consider ringing in the 2016 summer solstice this weekend with some likeminded creative types and fire starters in West Bolton. That's the location of this year's Zenith Burn, an annual weekend-long community arts, music and fire fest, which channels the spirit of Burning Man. Chris Cleary, 40, is Zenith Burn's master firebug and chief totem builder. About five years ago, Cleary and his fire-spinning wife, Kim, began holding community burns in their Jericho Center back yard — that is, until they realized the event was getting a tad too large for everyone's comfort. 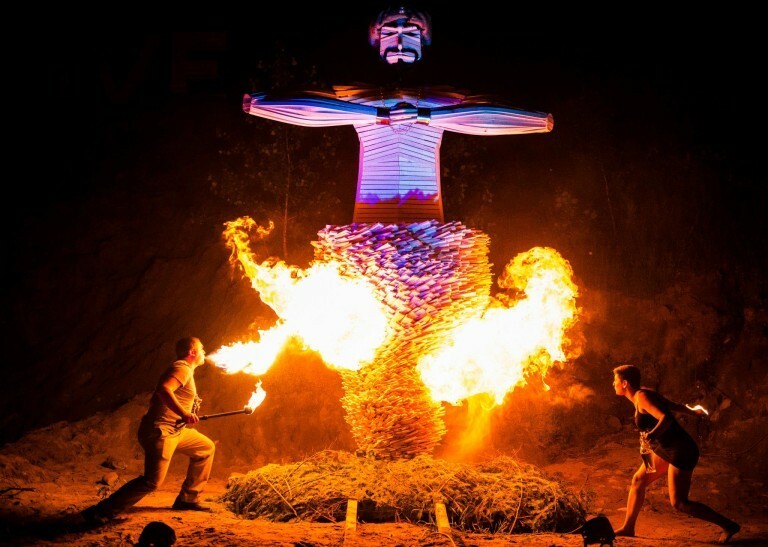 Chris Cleary, who also serves as the regional contact for Burning Man — Zenith Burn is considered an "unsanctioned" burn by Burning Man — is a sculptor by trade. The irony of building a 20-foot-tall statue each year, only to set it alight days later, isn't lost on him. Unlike his more permanent stone or metal works, the Zenith Burn wooden sculptures are all about creating an ephemeral but thrilling communal experience. Among the sculptures he's built and burned in the past were Father Time, Icarus, Helios the sun god, a minotaur, a leprechaun, a Spartan, a Sasquatch, a beaver and a woolly mammoth. Not all were torched to ring in the winter or summer solstices. For his son's seventh birthday, Cleary built a fire-breathing dragon, then set it ablaze. He won't says what's going up in flames this year — not because it's a secret, he emphasizes, but simply because he's not yet sure if he can pull it off. 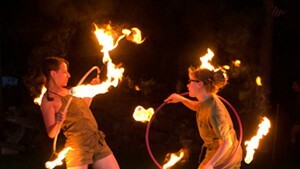 This year's Zenith Burn begins Friday evening, June 17, and runs all weekend. The big burn is slated for Saturday night. Daytime events include workshops and maker events of various kinds, all of them free. Camping is permitted. Due to town mandates and space and safety considerations, attendance is capped at 250 people. And, in keeping with the tenets of Burning Man, Cleary says that no sales of goods or services are allowed at Zenith Burn. The event also adheres to a leave-no-trace ethos, meaning that if you pack it in, pack it out. Kids are welcome, with a caveat. “We encourage families," Cleary says, but cautions that "we don’t sterilize the event." That means alcohol consumption is permitted, though it cannot be bought or sold onsite. Zenith Burn is also a clothing-optional event, he notes, provided that said nudists disrobe before leaving their camp, in keeping with the mandates of state law. Finally, campers are strongly encouraged to carpool, as parking is limited. Ticket for the 2016 Zenith Burn, June 17-19, can be purchased here.